Print your free Sustainable Schools Bookmark! 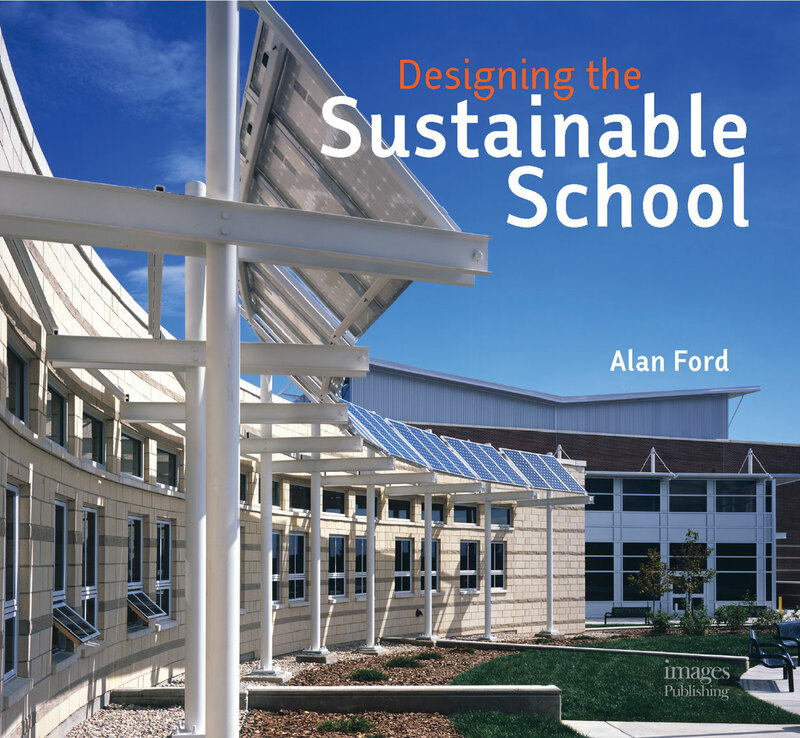 Purchase a digital version at Google Play This book presents a survey of K-12 schools from around the world that combine the best in aesthetics, sustainability and high performance design. K-12 school construction currently represents one of the largest sectors of new construction of any building type. Considering rising energy costs and concerns over the environment, there has never been more attention focused on the need to design schools responsibly. This book highlights the work being done by today's best architects in response to those needs while still creating beautiful schools for an enhanced learning environment. A SENSE OF ENTRY Amazon.com > Attending school, particularly in the early years of a child's development, can be a daunting experience. In this book, the writers have illustrated how the school can welcome students rather than intimidate them. 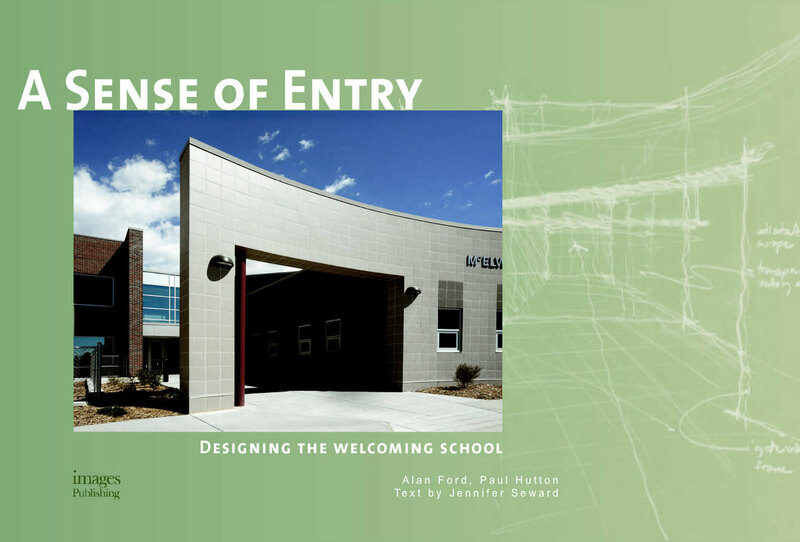 Exploring more than 25 unique design solutions by Denver-based Hutton Ford, this book is a visual celebration and analysis of the role of entrances in school architecture. See Alan Ford's Author Page on Amazon.com AIA ARCHITECT'S KNOWLEDGE RESOURCE ITEMS CONTRIBUTED BY ALAN FORD • TrailerWrap: A Study in Creating the Habitable Mobile Home by Alan Ford • The Colorado Fellows Book: A Case Study by Alan Ford • University of Colorado Denver Anschutz Medical Campus profile and visual tour by Alan Ford • Ray and Maria Stata Center for Computer, Information and Intelligence Services profile and visual tour by Alan Ford • Structural Poetry: On the Interaction of Architects and Structural Engineers by Gregory Kingsley, Ph.D., P.E. • Code Studies: Speeding Up the Plan Review Process by Steve Thomas, CBO • Chronicles of the LAUSD School Modernization Program • Stanley Tigerman and Chicago's Pacific Garden Mission • Timeless Architecture • I.M. Pei in Colorado • John Anderson (Colorado Architect) • WorldArchitectureNews.com • ArchNewsNow.com • The Architect's Newspaper • Inhabitat.com • Archinect - Connecting Architecture • LebbeusWoods.net • A Daily Dose of Architecture • Video: High Performance Building Perspective and Practice OTHER AIA ARCHITECT'S KNOWLEDGE RESOURCE ITEMS OF INTEREST Elements of a Successful Design Portfolio BOOKS FEATURED IN 100 More of the World's Best Houses, "Ford Residence." 2005: pp. 124-127. 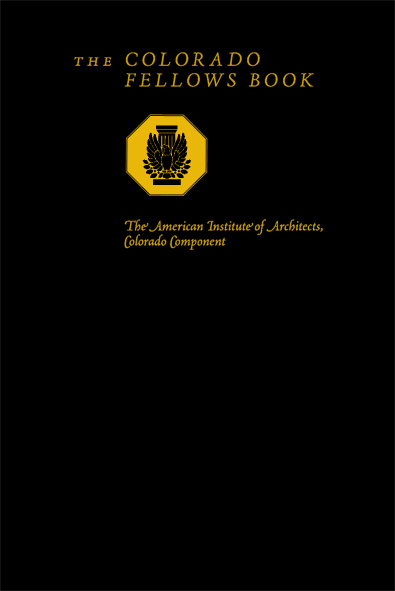 2000 Architects, "Hutton Ford Architects." 2006: p. 297. American Spaces, "Longmont High School Food Court/Commons Area." 2007: pp. 110-111. Details in Design, "Conical Metal Roof and Oculus," "Coloured Masonry and Entrance," "Masonry Pilasters," "Entrance Canopy and Masonry Detail." 2006: pp. 94-115. Interior Spaces of the USA and Canada, Vol. 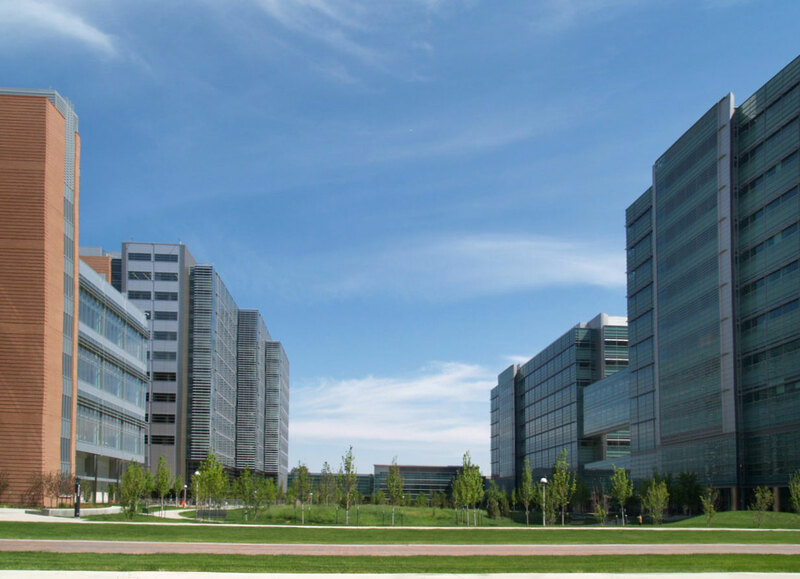 7, "Kent Science and Technology Center," "Image Arts, Etc." 2005: pp. 170, 211-213. Kids Spaces, "Alexander Dawson Lower School." 2004: pp. 103-105. A Pocketfull of Houses, "Ford Residence." 2006: pp. 132-137. The Ultimate Urban Makeover, "Colorado Modern." 2007: pp. 40-45. 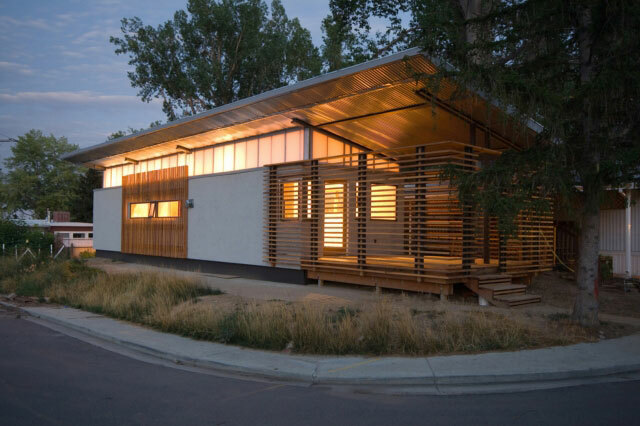 MAGAZINES/NEWSPAPERS FEATURED IN Architect Colorado, "The Green Scene." Summer 2008: pp. 18-21. Architect Colorado, "The Test of Time" by Alan Ford. Summer 2006: p. 66. Better Homes and Gardens: Simply Perfect Additions, "Repeat After Me." 2006: pp. 26-31. Better Homes and Gardens: Remodeling Ideas for Your Home, "Past Forward." Aug/Sep 2003: pp. 104-111. Denver Business Journal, "Taxi: Steering business owners together." July 4, 2008. Masters of Masonry Design, "School Learns New Lessons with Masonry Additions." 2004: pp. 46-47. MyHouse, "Brick by Brick." Jan/Feb 2005: pp. 64-71. WEBSITES FEATURED ON World Architecture News, "Architecture and the K-12 learning experience" by Alan Ford. July 2007.